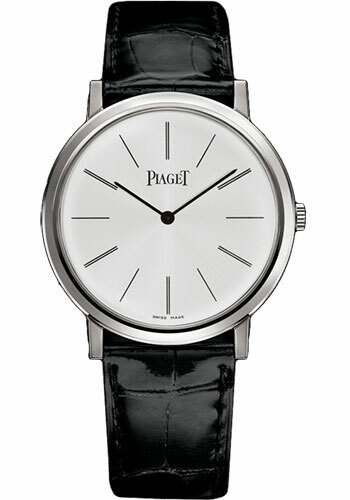 38 mm 18K white gold case, 6.0 mm thick, white dial, 430P manual movement, approximately 43 hours of power reserve, black alligator strap, ardillon buckle. Water resistant to 03 ATM. 38 mm 18K white gold case, 6.0 mm thick, black dial, 430P manual movement, approximately 43 hours of power reserve, black alligator strap, ardillon buckle. Water resistant to 03 ATM. 38 mm 18K white gold case set with 78 cut diamonds (approx. 0.7 ct), diamond bezel, white dial, 430P manual movement, approximately 43 hours of power reserve, black alligator strap, ardillon buckle. Water resistant to 03 ATM. 38 mm 18K white gold case set with 78 cut diamonds (approx. 0.7 ct), 6.4 mm thick, diamond bezel, gem set dial set with 735 cut diamonds (approx. 2.1 ct), 430P manual movement, approximately 43 hours of power reserve, black alligator strap, ardillon buckle set with 23 cut diamonds. Water resistant to 03 ATM. 38 mm 18K white gold case, 3.65 mm thick, stainless steel back, 18K white gold bezel, silvered dial with batons and bridges fitted, caliber 900P hand-wound mechanical movement with off-centered hours and minutes at 10 o'clock, approximately 48 hours of power reserve, black alligator strap, ardillon buckle. Water resistant to 2 atm. 38 mm 18K white gold case, 3.65 mm thick, bezel set with 78 brilliant-cut diamonds (approx. 0.7 ct), grey dial with gem set finish, caliber 900P hand-wound mechanical movement with off-centered hours and minutes at 10 o'clock, approximately 48 hours of power reserve, black alligator strap, ardillon buckle. Water resistant to 2 atm. 38 mm 18K white gold case set with 38 baguette-cut diamonds (approx. 1.36 ct) and 266 brilliant-cut diamonds (approx. 1.87 ct), 5.60 mm thick, gem set dial, 900D gem-set hand-wound mechanical movement with off-centered hours and minutes at 10 o'clock, approximately 48 hours of power reserve, black alligator strap, folding buckle. Water resistant to 2 atm. 38 mm 18K white gold case set with 94 brilliant-cut diamonds (approx. 0.87 ct), 7.9 mm thick, gem set dial with baton hour markers, 534P automatic mechanical movement with minutes, hours, approximately 42 hours of power reserve, gem set gold bracelet, integrated buckle. Water resistant to 3 atm. 38 mm 18K white gold case, 6.6 mm thick, gray flinqué dial, 430P hand-wound mechanical movement with minutes, hours, approximately 43 hours of power reserve, gray alligator strap, ardillon buckle. Water resistant to 3 atm. 38 mm 18K white gold case set with 78 brilliant-cut diamonds (approx. 0.71 ct), 7.0 mm thick, pink marquetry dial, 430P hand-wound mechanical movement with minutes, hours, approximately 43 hours of power reserve, white alligator strap, ardillon buckle. Water resistant to 3 atm. 38 mm 18K white gold case set with 78 brilliant-cut diamonds (approx. 0.71 ct), 7.0 mm thick, pink, white marquetry dial, 430P hand-wound mechanical movement with minutes, hours, approximately 43 hours of power reserve, white alligator strap, ardillon buckle. Water resistant to 3 atm. 38 mm 18K white gold case set with 78 brilliant-cut diamonds (approx. 0.7 ct), 6.6 mm thick, 430P hand-wound mechanical movement with minutes, hours, approximately 43 hours of power reserve, alligator strap, ardillon buckle. Water resistant to 3 atm. 38 mm 18K white gold case set with 78 brilliant-cut diamonds (approx. 0.71 ct), 8.63 mm thick, blue marquetry dial, 430P hand-wound mechanical movement with minutes, hours, approximately 43 hours of power reserve, blue leather strap, ardillon buckle. Water resistant to 3 atm. 38 mm 18K white gold case, 6.00 mm thick, blue dial with baton hour markers, 430P hand-wound mechanical movement with minutes, hours, approximately 43 hours of power reserve, blue alligator strap, ardillon buckle. Water resistant to 3 atm.